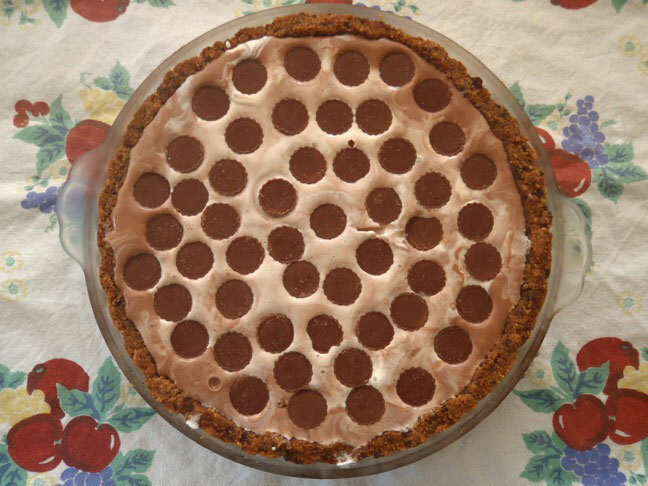 I make Double Chocolate Peanut Butter Cookies once a week (Every Sunday) and I have also incorporated using them to make this amazingly decadent Ice Cream Pie. My husband asked me to make the cookies once a week, because he rations them, having just a few each night. He says it helps him limit his dessert intake. It totally works for him, and ironically has had the opposite affect on me! When I needed a dessert for an impromptu dinner party the other night, I was happy to have our stash of peanut butter cookies at the ready! I ran to the store for a couple pints of ice cream and a bag of mini peanut butter cups and was good to go! Watch out, this dessert is pretty insane! Insanely good, of course! 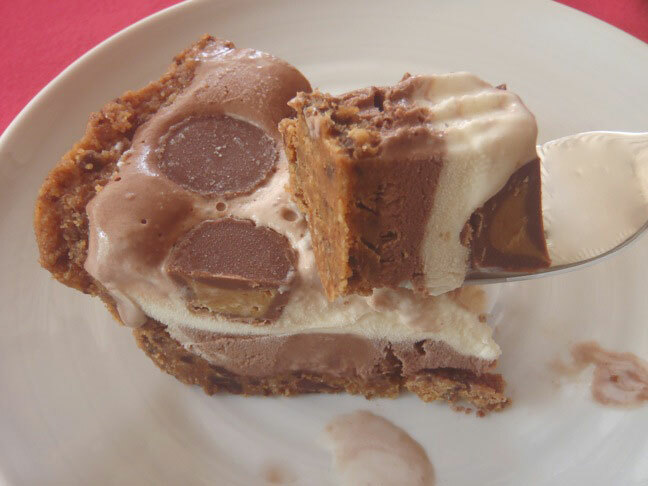 Set the ice cream flavors out to soften while you make the crust. 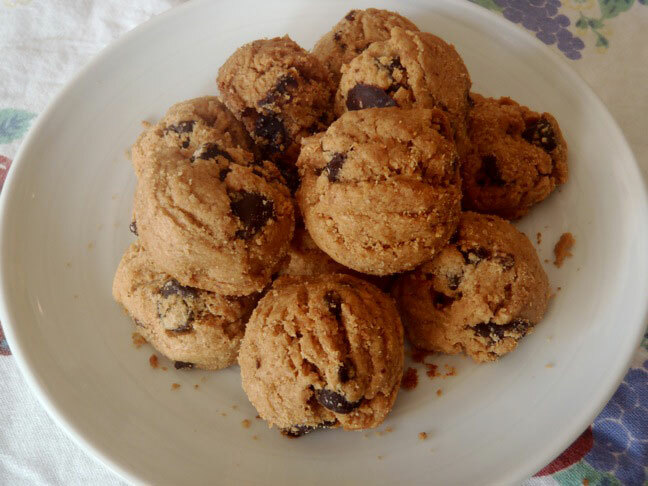 To make the crust, use a food processor to finely grind the cookies. The final result with be on the coarse side, because the chocolate chips will remain in tiny chunks. Pour the ground cookies into a mixing bowl and fold in the melted butter. Add the cookie mixture to a 9 inch pie plate. 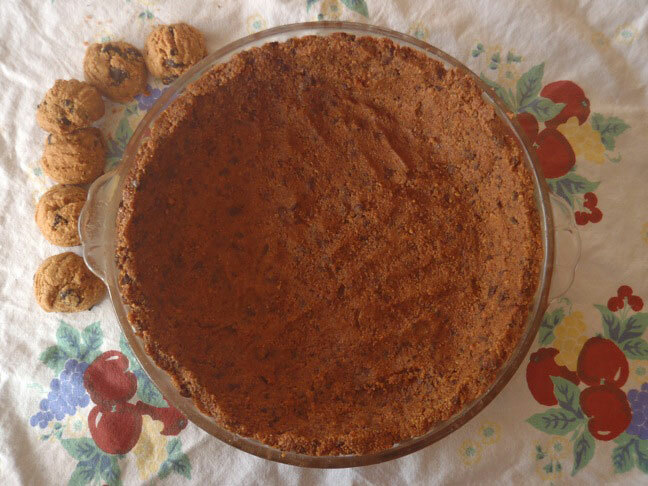 Using your hands, gently press the mixture to evenly coat the inside of the pie plate (bottom and all the way up the sides) to form the crust. It should be about 1/4 inch thick. Put the plate in the freezer until firm, about 10 minutes. 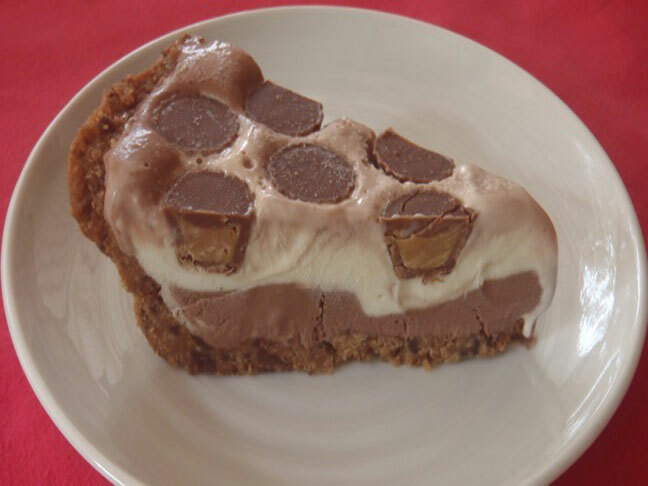 Then spread the chocolate ice cream evenly on the crust. Use a small flat-bottomed spreader to make it smooth. Return the pie to the freezer for about 30 minutes. Then spread the vanilla ice cream onto the chocolate. Then gently press the peanut butter cups, right side up, into the vanilla ice cream to cover the surface. Freeze for at least another 45 minutes. This dessert is 100% gluten-free, to boot!